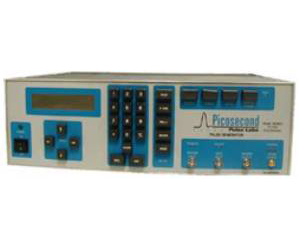 High-speed (65 ps risetime) pulse generator with excellent transient response with minimal overshoot, ringing, and sag. The 10,070A has adjustable pulse amplitude, positive or negative pulses, and variable baseline offset. The pulse shape from this standards-quality generator is extremely stable as amplitude and pulse repitition rate are changed. OurModel 10,070A produces ±7.5 V pulses with 65 ps risetime and duration adjustable from 100 ps to 10 ns. All of the pulse parameters, except rise/falltimes, are fully programmable via the GPIB (IEEE-488) interface. Both amplitude and baseline offset are adjustable. Slower risetimes can be obtained by externally attaching one of our risetime filters. Impulses can be created by adding an Impulse Forming Network such as the Model 5208 IFN.